Christopher Spring, a guest writer from Brighton meets Peter Stansill, ex-editor of the International Times, the esteemed anarchistic newspaper of the 1960s and 70s whose opening party at the Roundhouse was the first gig for a little known band called Pink Floyd. What was the International Times? IT actually started as Longhair Times, a ‘little magazine’ launched by the legendary (and late) John Hopkins (always known as Hoppy) and Barry Miles (always known as Miles). 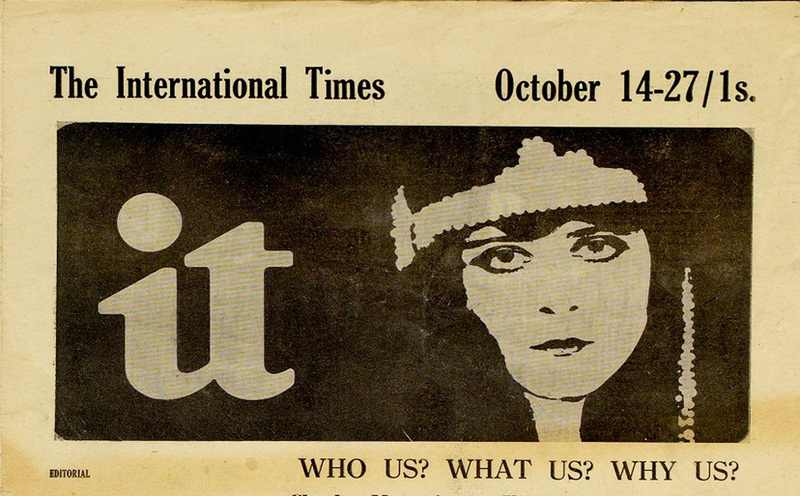 After one or two issues it morphed into International Times, launched on October 15 1966 at the Roundhouse party. What was your background before writing from the paper? And how did you find your way into eventually editing for the newspaper? I finished a three-year journalism apprenticeship on the local paper in Pontefract, Yorkshire, then travelled in 20-odd countries before ending up as a radio correspondent for Radio Press International during the Cyprus conflict 1963-64. After two years at an international college in Denmark, I returned to the UK and headed to London. I worked on the first 10 issues of IT as Operations Manager, then as a subeditor on the Newcastle Evening Chronicle before returning to London. “Hoppy” told me I was the editor. What was your favourite gig from that time? And, was there a dramatic difference in feeling from your perspective between the music industry in that time and now? I have no memory of my favourite gig. Pink Floyd played every week, they were basically the house band from the UFO Club’s opening in late 1966 until March 1967 when we rented the Blarney Club in Tottenham Court Road every Friday (UFO soon moved to other venues). The music was highly inventive and creative, even trail-blazing and epoch-defining, and much of it hasn’t aged that much. No one knew Pink Floyd would turn out to be one of the great bands of the 20th century – UFO was their nursery. John (Hoppy) Hopkins who, founded UFO along with then-Floyd manager Joe Boyd, had nurtured them and got them rehearsal space at All Saints Church Hall, Notting Hill, before their first public gig. Being a journalist and editor in the UK’s first alternative newspaper must have been a pretty exciting time. I can imagine that you had some pretty close calls with the authorities both as a writer, and also personally! Are there any that particularly stand out? Highly stressful. I was the only IT employee who witnessed both police raids. The Old Bailey trial was the highlight. As the trial went on and you began to see the seriousness of the entire process unfolding, namely the horrific homophobia entrenched in the establishment, did you ever feel tempted to print an IT that really attacked the establishment, presenting your own version of events in a public forum? And, if not, what did the IT magazine focus on with some of the editorial team engaged in a trial? It wasn’t appropriate at the time. We were facing possible life sentences for conspiracy to corrupt public morals and the case was sub-judice, dragging on through the courts to the House of Lords over two years. The priority was to raise funds for the defence. Meanwhile, IT was put out by rotating guest editors backed by our large cohort of freelance writers. IT never missed a beat. Another major problem was finding a printer who would print IT – most of them got scared when we were busted, some were even visited by the police. Why do you think there was such a difference between the establishment and IT’s attitude towards LGBT people? Generations moving on or something more insidious? It seemed obvious to the new generation of the 60s that all the old Victorian attitudes were obsolete and socially destructive – racism, sexism, homophobia, class prejudice, xenophobia and all the other forms of intolerance. Our job at IT was to break down these barriers to social harmony. We’ve come a long way, but old British habits die hard. What are your personal memories of the Roundhouse as a venue? I first went to the Roundhouse a few weeks after the IT launch, which was on Oct 15 1966. Seeing The Who was a personal highlight of mine. I even organised a fund-raiser in the Roundhouse for IT, called The Uncommon Market in early 1967. That’s when a naked Mike Lesser covered himself in paint and slithered across rolls of newsprint, selling the resulting artwork. This entry was posted on 27 October, 2016 in homepage. Bookmark the permalink.